And yet, some domain are jingly, like "quick.ly", and some are just domain hacks, e.g., "fami.ly". 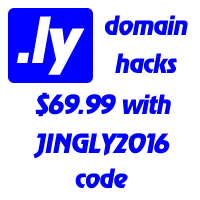 Obvious.ly, jing.ly names are worth more than hack.ly ones. “ROCK and roll is dead,” sang Lenny Kravitz. It is certain.ly poor.ly. Music was the first media business to be serious.ly affected by piracy and has suffered most severe.ly. Talking about available domains, “shy.ly” is a one. Surprising.ly, sing.ly and sign.ly are still available while surprising.ly is taken. Proud.ly and Tip.ly can be yours for just 500 $US! Another one to grab is sore.ly – a funeral agency maybe? Until 10th of January, coward.ly was still available. But as cowardly.com is now promoted on Sedo’s Great Domains – .ly version of the jingle was gone in seconds. Just looked up fatal.ly – goes as of November last year. For your information close.ly was sold for $5000 in last December. We’re here to make real-time social networks work better for businesses and consumers. We’ll connect you to offers from local businesses you know and trust. We’re putting promotions in the right place — around you. A nice thing about the page, is that if you reload it, by pressing F5 key, you will get it in different colour.